Purse magic trick tool for the poker game. Really amazing! You can exchange the cards on your hand with the card you hide in the purse before in one second and no one can notice it. The appearance of purse is the same with normal purse. Nobody can notice it. It is easily to use the purse cards exchange tool. Depends on your determination for ending the bitter loss from other poker players. Are you tired to use the infrared contact lens to read the luminous marked cards? Do you want to make the poker game more easy and simple? 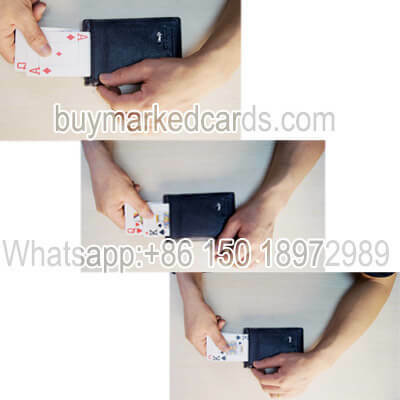 Use the purse cards holdout to exchange the non marked playing cards, you do not need to mark the cards, this is the best simple way to become the winner in the poker game. How to use the cards exchange tool to change a high rank poker hand when playing the Texas holdem or Omaha poker game.This is cards exchanger taken to the next level. You do not need other partner to tell you the poker numbers or suits by earpiece or any poker scanning system. Do you want to own a good hand playing cards when you play the poker cards? Purse gamblers holdout device can help you to get the best hand cards.